Everybody knows you celebrate St. Patrick's day every weekend in March! 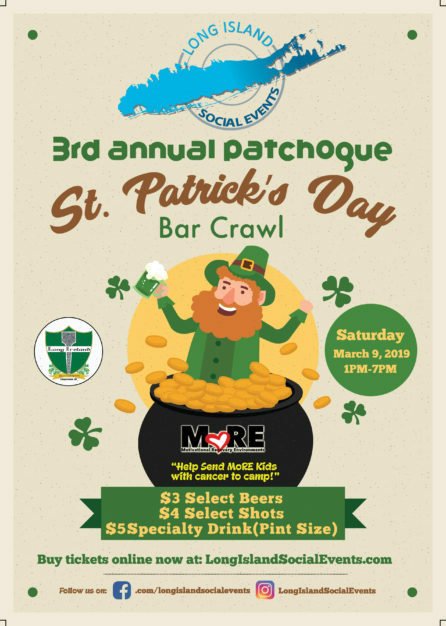 Come join Long Island Social Events for our 3rd annual St Patrick's Day Bar Crawl March 9, 2019 in Patchogue NY. Join us for great drink specials, while raising money for MoRE please check out the amazing work they do by visiting our charities page. Show your St. Patrick's Day spirit and WEAR GREEN! Visit our FAQ's page for any questions.